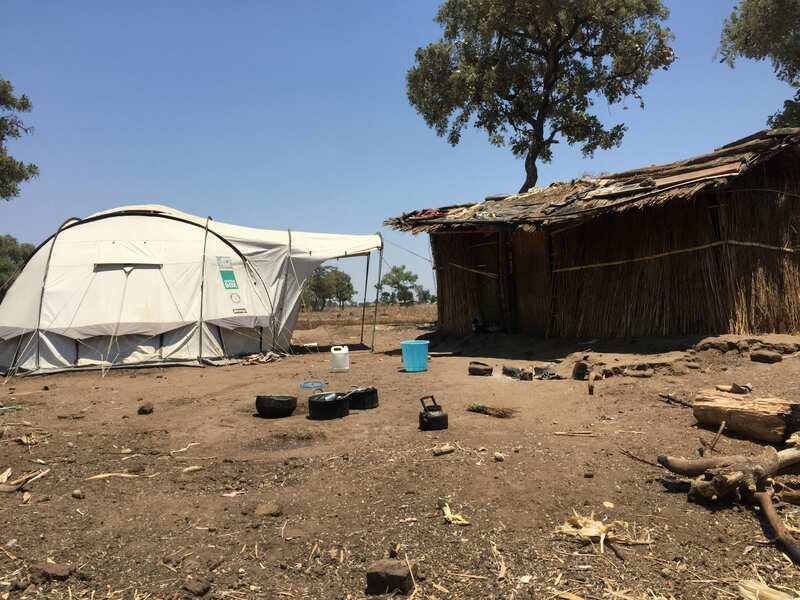 Last month we went back to Malawi, for a check-up on how beneficiaries of ShelterBox’s kit are doing, and for an overview of how the country is recovering. I appreciate the ShelterBox deployments in part because they give me perspectives on other countries and cultures that I wouldn’t get as a normal tourist. I get to meet folks on their ground, witness what their lives used to be like, the lives they’re striving for. All disaster-landscapes look the same, but it’s often in these hard times that you really get to meet a culture, see how they interact with each other. We’re definitely not meeting them in their normal lives, but we are meeting them in their communities. It wasn’t until this last deployment that I had it thrown into sharp focus what it might really mean to live their lives. In the first place, I got giardia when I got home. I mean, I probably got it in Africa someplace. But those little flagellated protozoa didn’t make themselves known until four or five days after I landed, when I was busily trying to do real-life things like writing jacket-copy for my forthcoming novel (that’s not real life, is it? Is it?) and paying bills and done with immediate deployment-aftermath things, like a lot of sleep, and sushi and salad, and laundry. Very very annoying. In the second place, we spent three days in a place where it was up to 111° F (that’s 44° C) in the shade. And then, when we got back to our very poorly ventilated rooms, it was maybe a skosh cooler, but not by much. It was so hot that for part of the time I slept sitting up, so as to minimize contact of myself with, well, anything. It was so hot that I became irrationally annoyed at the silicone hair tie around my wrist, convinced that it was blocking pores that would otherwise be making everything cooler. And that’s when I started thinking about my Creature Comforts kit. It’s a little pouch I take with me on every airplane ride, mostly because I’m lazy as sin and can’t be arsed to stand up and dig in my overhead baggage compartment. 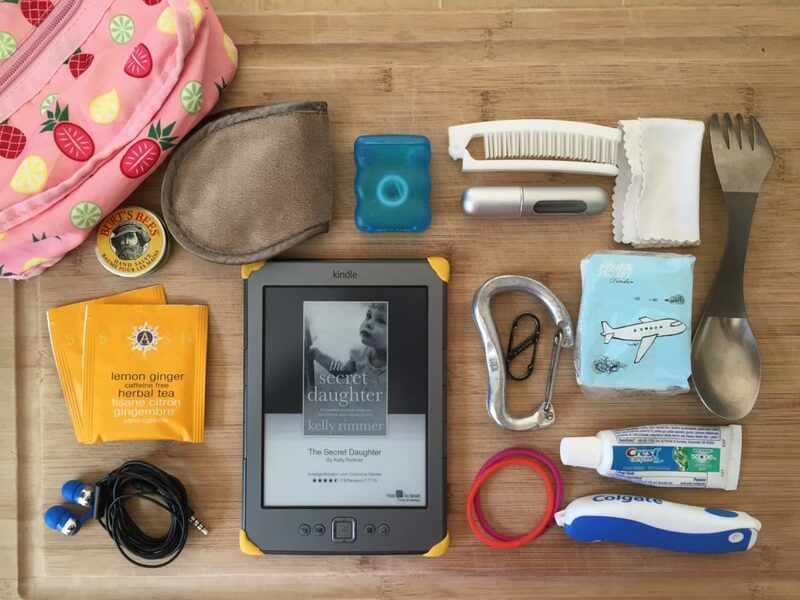 When I board the plane, I immediately unpack this little pouch, a litre bottle of water, and some food, and then I don’t have to mess with my bag for the rest of the flight. Here’s what’s in it. But then, when I was lying there in my room, so hot I couldn’t sleep and practically gasping for air flow; and again when I was lying on the couch, moaning out loud to myself and imagining a Satanic game of bumper cars with parasites in my gut, I realized, damn it all to hell, this is life for some people. This is permanence for nearly everyone we meet whilst we’re on deployment. And when we go back home, to clean water out of the tap and air conditioning and fresh fruit and veg every single day, they still go on, getting sick from drinking river water, or living in mud-brick houses that, while staying cool, don’t change the fact that you still have to go outside and work in the fields, in 111° temperatures, every damn day. Every. Damn. Day. We help a little bit. We provide water filters, so people can stop getting sick from the drinking water. (Families who live near boreholes can use chlorine dispensers that purify the water.) And our kit comes with solar lights, so folks can actually see what they’re doing inside their windowless homes (so made because it’s hard to make windows in a rush-grass home, and also, windows let in heat), and when they walk out to their latrine or bathroom at night. Our kit comes with blankets, fuzzy groundsheets, kitchen sets. Mosquito nets, so your family doesn’t get chewed up by mosquitos and then get sick with malaria. You know. Things that make life a little bit better. Every damn day. This isn’t one of those posts that’s all like, Oh, I feel so guilty that I’m so privileged, because it’s not like that. Some of us are lucky to have been born into better circumstances, places with more opportunity, or different standards of living. We can’t change that; no sense in regretting it. But every once in awhile, you get floored by something like extreme heat, or giardia, and you realize just how much bigger our world really is. And, more importantly, how little we really know, and experience, in our limited lives. And then, on the heels of that, how lucky we really are, and how nice it is to be able to hope for more, for others and for ourselves. That, too, is a creature comfort. Tell me, what are your creature comforts? Let me know in the comments below.